I draw these lines using "Equidistant Lines" charting tool by dragging the mouse from point A to point B. The good confirmation of significance this cycle is when other vertical lines point at turning points as well. 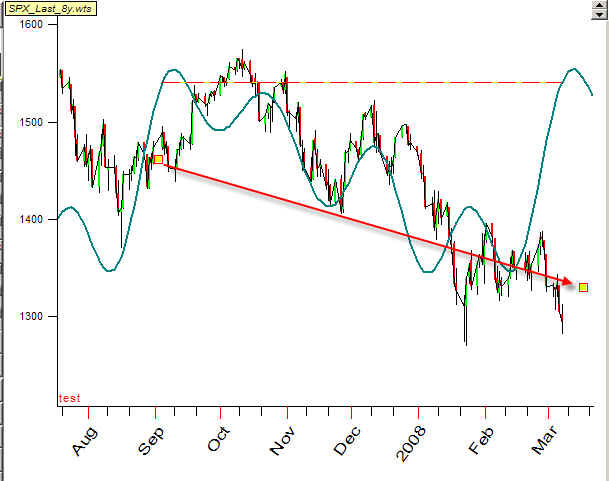 We can draw these lines using calendar time or trade days only (excluding holidays and weekends). Thus you will be able to adjust your model to real price history data. This procedure takes several mouse clicks and several seconds for calculation. Play with different cycle combinations, amount of overtones and with different waveforms. This approach is very effective. It allows to obtain very easily the projection line based on advanced technologies. 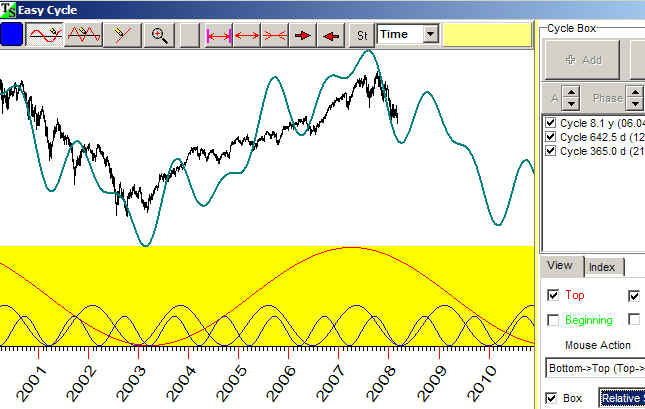 Another charting tool, "Harmonic string", allows to set the dominant cycles manually. Let us return to the question above, how we measure cycles. 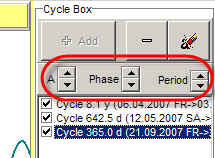 You can calculate the cycle's period in calendar days. It is a regular way of understanding the time. As an example, we may say that the distance between two succeeding turning points is 35 calendar days. 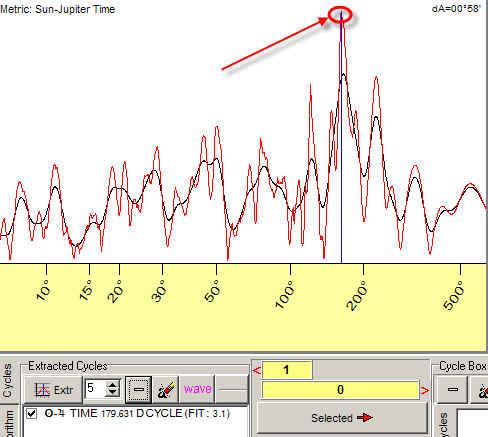 The variation of this approach is to calculate the cycle's period using trade days only (i.e. excluding weekends and holidays). Therefore, we have one more charting tool that works exactly as other charting tools: you simple drag the mouse from one turning point to another one. The difference is that you choose as well planetary combinations that describe the turning points the best way. The peak around 180 degrees means that the price repeats its pattern while the angle between the Sun and Jupiter is changing within 180 degrees interval. It corresponds approximately to 200-days regular cycle. You can work with these cycles as with usual cycles, i.e. 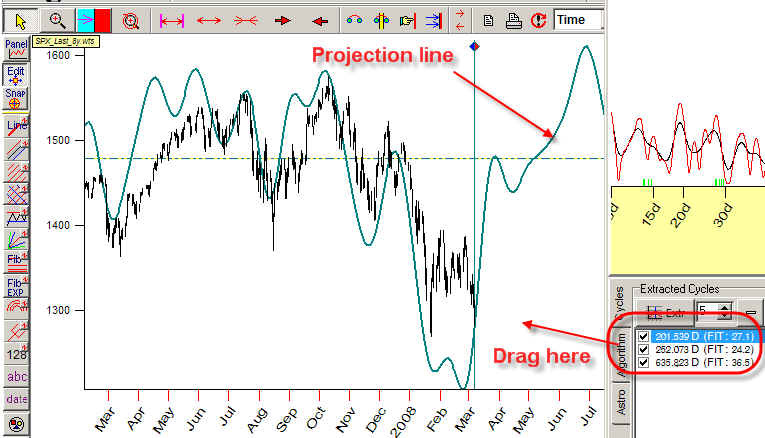 drag it into Main screen and get projection line based on this cycle. In Timing Solution you can create practically all possible variations of AR models. Also (and this is the most important) you can create nonlinear AR models (using methods of Fuzzy Neural Network). Also I would like remind that MESA (maximum entropy spectrum) technique is mathematically equivalent to TS linear regression model. 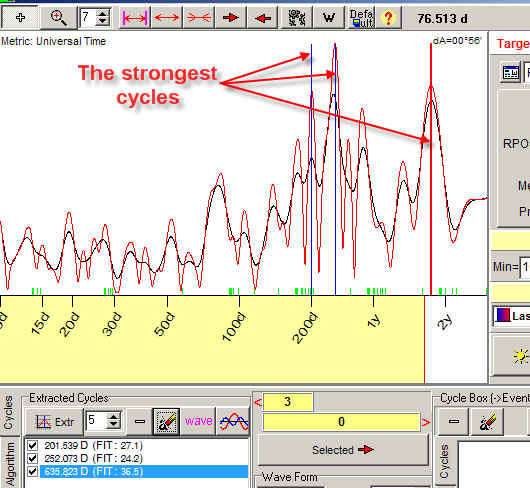 Chaos Theory allows to reveal non obvious cycles - stochastic cycles. Neural Network is an universal tool of getting a forecast. It can work with any models created by you with the help of Timing Solution. Also, all models used in Neural Network module can be Back Tested. See more information about Neural Network technology on the website.